SBI PO 2017 notification for the year 2017 is finally out and this time with number of vacancies 2300. Registration portal is already live from today and it will last till 6th March. As per tentative schedule, the prelims exam will be on 29th & 30th Apr and 6th & 7th May, 2017. 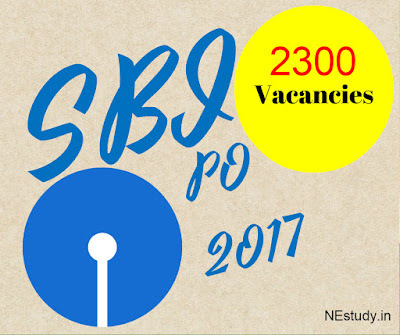 Read this complete article to get brief idea about the SBI PO exam, Are you eligible to apply, if yes how to apply. Alternatively you can check the official notification, link is given at the bottom of this article. This para is only for those who are completely new to this exam. SBI PO exam is conducted in three phase. First is Preliminary Examination. This exam will examine your English Language, Quantitative Aptitude and Reasoning Ability in 100 marks each question carrying 1 marks and in a duration of 1 hour. That is, in 60 minutes you are to attempt 100 questions. To make it possible, it is highly recommended to learn QuantitativeAptitude shortcuts like Multiplication Shortcuts, Percentage Calculation Shortcuts etc. Only if you become successful in Prelims, you will be shortlisted for Main Examination. Main Examination is a combination of objective and descriptive part carrying 200 and 50 marks respectively. Objective Test is a 3 hour duration test which will examine your Reasoning & Computer Aptitude, Data Analysis & Interpretation, General/Economy/Banking Awareness and English Language. Descriptive Test is of 30 minutes duration that will mainly test your depth in English Language by means of Letter Writing or Essay Writing. After successful clearance of mains, you have to appear in Group Discussions and Interview which carries 20 marks and 30 marks respectively. So you need to know well how to prepare for Interview and GD. Marks of mains plus interview and GD will only be considered and final selection list will be made. One more thing to know, you can not appear in SBI PO infinite number of times. General candidates are restricted to 4 times and OBC and PWD to 7 times. However, appearing in prelims will not be counted. Must Read: How to Prepare for SBI PO Exam. The only necessary educational qualification required to appear in this exam is graduation from any recognized university. Age should be in between 21 years to 30 years as on 1st April, 2017. However, there is relaxation for reserved category. All you need to do is go to State Bank of India's official website www.sbi.co.in/careers or www.statebankofindia.com/careers. Register as new user and fill all the necessary information and pay the requisite amount through online mode only and then upload the scanned photograph and signature in required format. You are done. The fee is Rs. 600, however for SC/ST/PWD, it is Rs. 100. Best way is to start your preparation right from today. Practice mock test papers as much as possible. Below are some guides which will help you in moving a step closer to success. You have something to ask? Just let us know in the comment section below, we will be happy to answer you. Download the official notification here.